Selected by Emily Conover, who is an adjunct professor of art at the University of Maryland, where she teaches drawing and painting, the Art League's Small Works show, and much like the Target Gallery's 5x5 show reviewed here, proves that if the talent is there, size doesn't really matter in art. 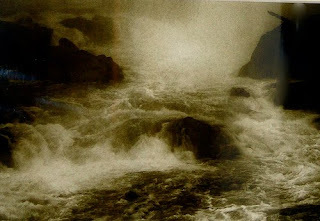 Conover awarded the Eleanor Boudreau Jordan Award to Untitled I a very cool silver gelatin print by Andrew Zimmermann. The Second Place Award went to a superb oil titled Playing with Dandelion by Kim Stenberg. 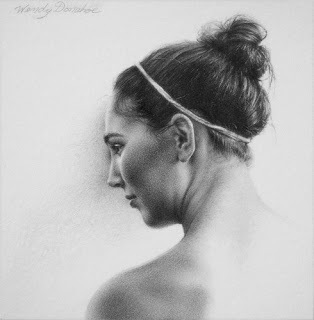 She also passed Honorable Mentions to the entries by Diane Blackwell, Kathy Clowery, Marcia Dale Dullum, Avis Fleming, Janice Sayles, Jean Schwartz and Xiaolei Zhang and from the 530 works of art entered, she accepted 158 for the show. With prices as low as $35 for an original work of art (check out the images, titles and prices here), this is a terrific show to visit and come away with either an unique art present or a small addition to one's own art collection. In this show I was once again floored by the technical ability of Wendy Donahoe, whose entry titled Haley is a breath-taking small graphite portrait that jumps out of its tiny environment because of the artistic prowess of Donahoe. The woman doesn't just draw well, she draws spectacularly well and then she manages to go beyond being simply a talented hand and also manages to cross the line into the realm of solid composition and that psychological "it" that is so hard to capture in a portrait. Keep your eye on Donahoe and somebody better go buy this drawing now. 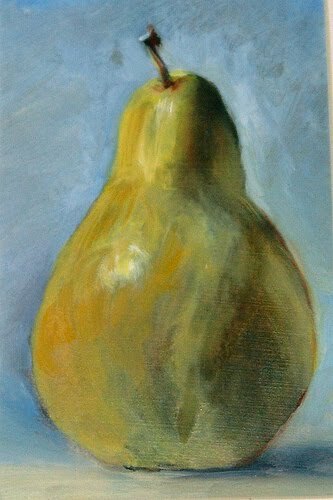 The tiny monumentality of Xiaolei Zhang's Single Pear, a gorgeous little oil painting that you can pick up framed for $80, underscores the fact that most good painters know: a tiny, small oil can be just as difficult and challenging to deliver well as a large painting. In fact you can even make the case that it is even harder because of the scale. Zhang's pear succeeds because Zhang knows how to paint and now the challenge becomes delivering with skill on a small scale. It is a success in this case. The image here is terrible (it should have been scanned rather than photographed), but I also liked T. Pham's Beach Season Begins, a brilliant little pastel that crams a lot of visual information into one very small piece. Even up close hanging on the wall, it has the feel of a large work, not an easy trick to accomplish in such a small scale. I also liked U. Dehejia's gorgeous employment of wet on wet watercolors to submit an impressive flash of color in this tiny landscape. And I have no idea how H. Rodkin's diminutive photograph Mist Of The Potomac manages to come across like a giant Thomas Cole painting, but it does. The show goes through December 6, 2010. I am surprised to report that Giant's rotisserie chicken is much better tasting than Whole Foods.